Alright girls, it's time to get our shopping done for the men in our lives! Every year I try really hard to find GOOD gifts for Billy that he will actually use or wear long term. I absolutely love these Johnston & Murphy Oxford dress shoes (they are Billy's favorite brand of shoe for work), they are so sharp! And I think The North Face vest or Patagonia Pullover are great options for casual everyday wear. This Fitbit Watch would be a true winner if he's into fitness (or even just loves electronics! ), along with a new briefcase for his laptop. This one has amazing reviews and is on sale for $62, normally $80! Also...I typically like to get a fancy shaving kit for Billy since he normally doesn't splurge on these type of items, so this year I got him this Winter Winston Set from Harry's. 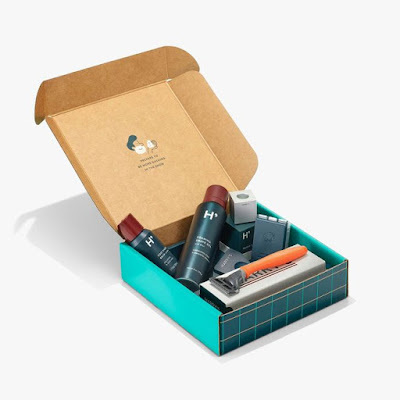 It has everything he would need (limited edition razor, shave gel, 3 blade cartridges, and 1 travel blade cover) for just $30! It can be engraved and comes in a pretty midnight blue. They also have a nice deluxe set with a few more products included for $50! Hope you all had a great weekend and I hope this gift guide helps because I know how hard shopping for men can be! Happy Monday!